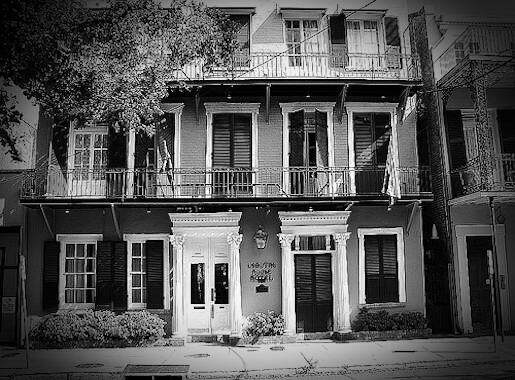 Richly decorated and tastefully furnished, the historic Lamothe House Hotel in New Orleans gives guests a little taste of New Orleans history with the added tales of murder, suicide and the supernatural. Hotel staff and guests have reported seeing the ghost of a mysterious young woman dressed in red. It is reported that she emerges from one of the rooms and then suddenly vanishes. She is probably the hotel’s most popular and most frequently reported ghost. Ghostly children can be heard laughing in the middle of the night and their mother can also be seen walking down the hallways, apparently looking for them. Guests regularly catch faces in pictures taken throughout the hotel, so don’t forget to bring your cameras! The property which the hotel now stands on was first owned by Miss Marie Virginia Lamothe. In 1829, she bought two parcels of land which faced the Esplanade Avenue. After four years, she sold the property to her brother, Jean Lamothe. He was a wealthy sugar cane planter and he had a double townhouses erected in the property, the first of which was built in 1839. In 1859, the Lamothe family sold the property to Paul Rivera and Henry Parlange, both Frenchmen. Renovations were made to the property and the two men hired Louis Folliet. Some of the things which were changed were the doors and shutters. The carriage entrance was also converted into a main entrance and hallway, an unusual feature which still stands out to this day. During 1860, another renovation was made and the Corinthian columns which can still be seen until today were added. Other things added were the two winding stairways which go up to the second floor area and the double entrance. Some of the best architectural features of the hotel which still stands until today are the ceiling timbers, iron fastenings for windows and doors; rolled glass window panes and the great cypress floors. The Lamothe House Hotel has 30 guest rooms that have been refinished in a traditional style, and 5 Grand Antique Suites, that have been preserved from the original 1839 construction of the house where Jean Lamothe lived. All rooms are furnished with decorative fireplaces, antiques and other splendid architectural features, reminiscent of old New Orleans. The Lamothe House Hotel has received several accolades and it continues to be the favorite of many tourists who visit New Orleans. Guests in New Orleans can stay for a month and find that they still do not have enough time to soak in the city and all the great things it has to offer. New Orleans is a place which is full of museums, art galleries, clubs, bars, restaurants and historical sites. Dubbed as the Big Easy, it is also the home of countless world-class aquariums and zoos. Jackson Square is located in the French Quarter and was originally known as the Place d’Armes. It was founded in the early 1700s and travellers to the place can witness a display of artworks by various artists. There are also mimes, musicians and street performers. Audobon Zoo was founded in the early 1900s and is one of the best places to go to when you have children in tow. Bourbon Street is where you can see thousands of people party throughout the night. It offers dozens of bars and clubs and is the best place to go to for people looking for a party.